Recently, I had the pleasure of having to use my health insurance for the first time. I’d had a cold that was just not going away, so I needed to visit a doctor. Problem was, I had no idea how to find a doctor in Germany. 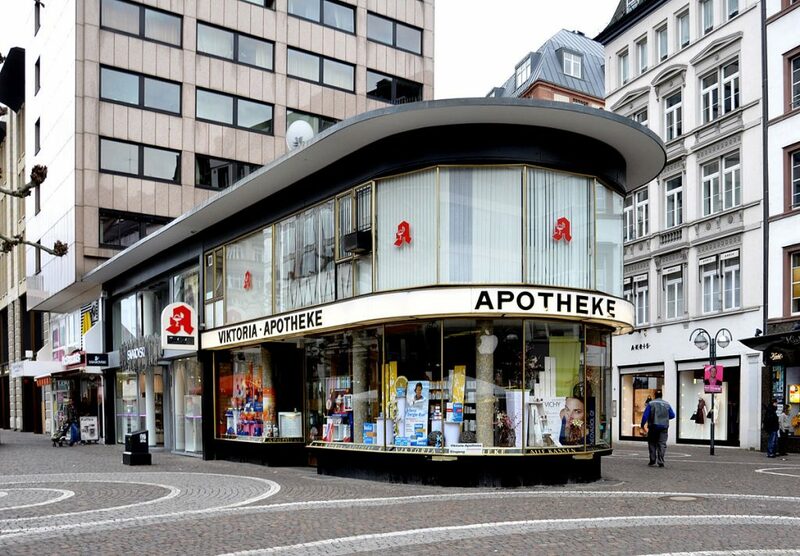 Can you find the Apotheke (pharmacy)? 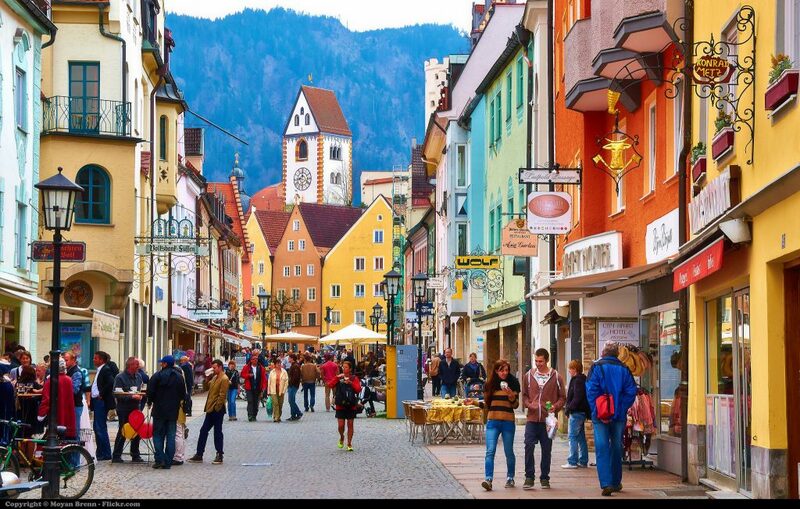 I found just one in this photo of Fussen, a smaller town in Bavaria close to Neuschwanstein Castle. Image credit: Moyan Brenn. Ugh. Nobody wants to have to do this. But, there are times when you just need to go to a doctor. Of course, I had health insurance, as it is mandatory for all people living in Germany. So that wasn’t a problem. However, knowing how to use that insurance was another story entirely. Where are the doctor’s offices? Do I need an appointment? Do they speak English? And what do I have to pay? So, as usual, I turned to the almighty Google. It turned out that finding an English speaking doctor in Germany wasn’t so hard. Quickly, I found this document from 2013 put out by the US Consulate General here in Munich. The document is a general overview of health and related service in Munich, and Bavaria generally. But, more importantly, it has a list of English-speaking health professionals here in Munich. The list of general practitioners starts on page 17. After a cursory look through the list, I found a doctor whose office was just down the street. I checked their office rating on jameda, a very popular website for reviewing doctors in Germany. They checked out. So the next day, I dragged myself out of the apartment and walked down there during the morning visiting hours. The office was a little busy when I got there, which I suppose was because I arrived around 11. I registered/checked-in at the front desk by simply handing them my Gesundheitskarte (Health Insurance Card). The secretary told me, in German, how long the wait would be and showed me to the little waiting area. Even if the doctor speaks English, it isn’t guaranteed that the support staff will speak English. Some offices do offer a variety of languages services, however. 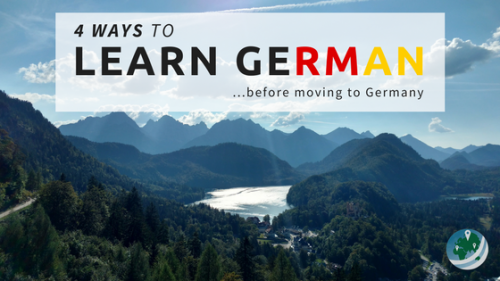 In any case, you don’t need much German to get by in these situations, so don’t worry too much. After about 20 minutes or so, they called my name and directed me down the hall to the doctor’s office. The visit itself was very short and to the point. I explained, in English, to the good doctor why I was there. Persistent cold, occasional fever, etc. He did the typical doctor checks, like listening to my breathing and looking into my throat for signs of other ailments. All good, so he scribbled a prescription on a little piece of paper, stamped it, and told me he was prescribing some antibiotics. Stupidly, I asked where I could fill this prescription – and he said at any pharmacy. So, he thanked me for visiting, told me to feel better, and to return if the medication doesn’t help. Feeling a little sense of ennui for not visiting the doctor sooner, I left the office and headed out to find a pharmacy to fill the pharmacy. These little shops are everywhere – you might not notice them if you don’t know the symbol, but once you do you start to see them everywhere. The big red “A”, combined with a caduceus (that symbol with snakes that’s associated with healthcare), marks every Apotheke. I’ve also seen a red or green cross accompanying the “A”. An Apotheke in Frankfurt, displaying the symbol marking a certified pharmacy in Germany. There was a pharmacy just outside the doctor’s office on my walk home, so I stepped in. I switched to English here, because I didn’t know how to say prescription in German. I know, I’m a bit of an idiot for not looking that up beforehand, and it was probably on the prescription note. Anyway, the pharmacist there looked at the note and asked for my Gesundheitskarte. After proving I was the person on the prescription, she went back to the shelves and drawers of medications. She handed it to me over the counter, and told me to feel better and have a nice day. For the umpteenth time that day, I probably had another idiotic look of confusion on my face. Turns out that getting your prescription filled is just as easy as going to the doctor in Germany. Stupidly, I asked if I had to pay anything, and she, confused by my stupid question, just shook her head and said no. Of course, my health insurance covers that completely! I walked back home feeling like an idiot again, but happy I had successfully, finally, gone to the doctor in Germany. It’s a lot more intimidating than it might sound! When you’re the equivalent of a 5-year old kid with regards to your understanding of society, everything is a little bit intimidating. So, it wasn’t so hard after all. Just another example supporting my theory that there is this vast cultural knowledge of how society works that we really take for granted. Moving abroad is a constant challenge in situations like these, and it can be a little annoying. Just like learning a new language, though, living in another country really forces you to reset your mind. Without moving abroad, it’s really hard to imagine how much of your understanding of the world really is based on where you grew up. If anything, my short time here in Munich has just reinforced that theory, time and time again. I think this bit of transitional time, full of embarrassment and feeling like an idiot, will be so worth it in the end. Most of the time, we only think about the excitement of a new adventure. It rarely comes to mind what we should do in the cases of an emergency until that time. Having tips about the best way to find a doctor while traveling in Germany is valuable! 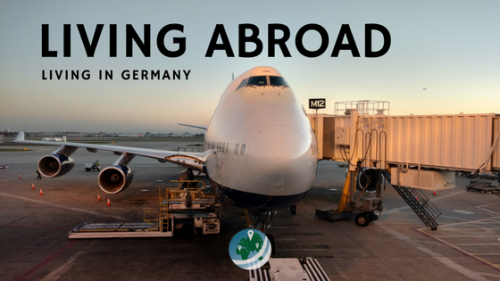 This post was more meant to give info to those looking for an English speaking doctor after they’ve moved to Germany for checkups, tests, and other general visits – in general, a primary physician. Thanks for the comment, Danielle! Thanks for sharing! Did the doctors in Japan speak English at all, or did you have to search for a special one…or did you brave it and push your language skills? 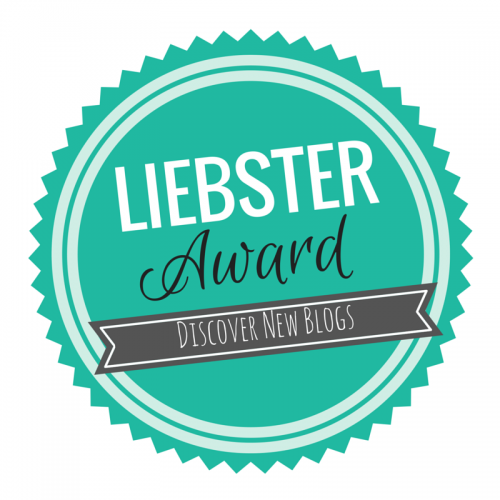 I’m surprised you could just walk in – lucky! I’ve found that with most doctors you have to be a registered patient (I live in Berlin) and that some are turning people away. However, we’ve been lucky to get a doc around the corner for the kids, and ours isn’t too far away. Both speak English, although the reception staff may or may not. So far we’ve managed to communicate! 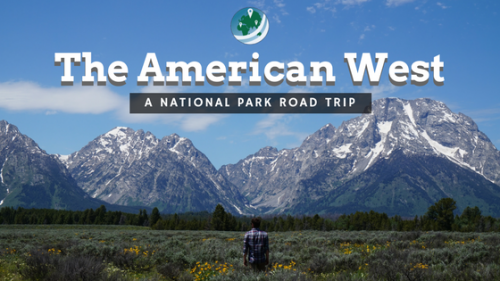 If I may ask – are you American? If so, what brought you to Germany? my son is going to school in Berlin, he doesn’t know anyone. Can you suggest a doctor. His German is good. He is trying HARD to get his college degree from Germany. SO far 2 doctors have not returned his call. We are spoiled from New Jersey. I live in Munich – this is most definitely not Berlin. I have no idea which doctors are in another city. I have the doctor here in Munich that I regularly go to, but doctors are around every corner in Germany. Most are pretty good, but internet searches might help to separate the wheat from the chaff, so to speak. Some will be better than others, as with everything. Thanks for sharing Fibi!! That looks like a cool service, but how does it work? There’s not much info on the website. I’m not sure what happened in your situation, but you will likely NEED a health card to meet with a doctor at all. An EU health card of any type would be good. However, your situation seems to have been a bit more serious, in which case I would have just gone to the hospital, and not the normal doctor’s office. About paying, I’m not even sure that would work. I have no idea how doctor’s handle non-insured people as everyone in Germany is required to have health insurance and has been since 2009. I hope everything turned out okay and that you have a health card in Denmark! To any other people reading this down the line – if I were in her situation, I would have googled “health insurance Germany from Denmark” to see the laws and regs in place. Denmark is an EEA country, so it is included in the EHIC program (European Health Insurance Card). That means that if you have a card issued by a public insurer in Denmark, you can use it in any other EU or EEA country just as the local residents do.